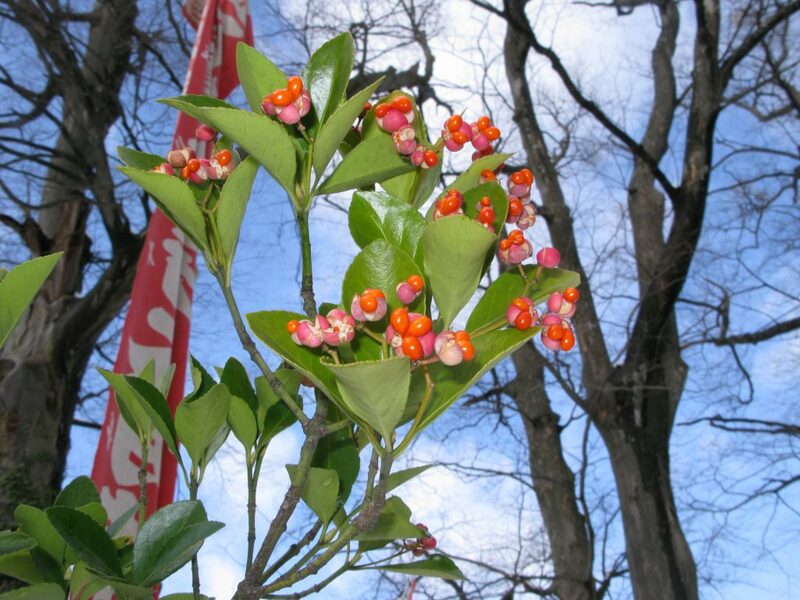 Euonymus japonicus is an evergreen shrub to 4.5 m tall, stems green, young stems somewhat 4-sided, pith green; buds pointed, narrowly cone-shaped, scales overlapping, green, tinged with red in winter. 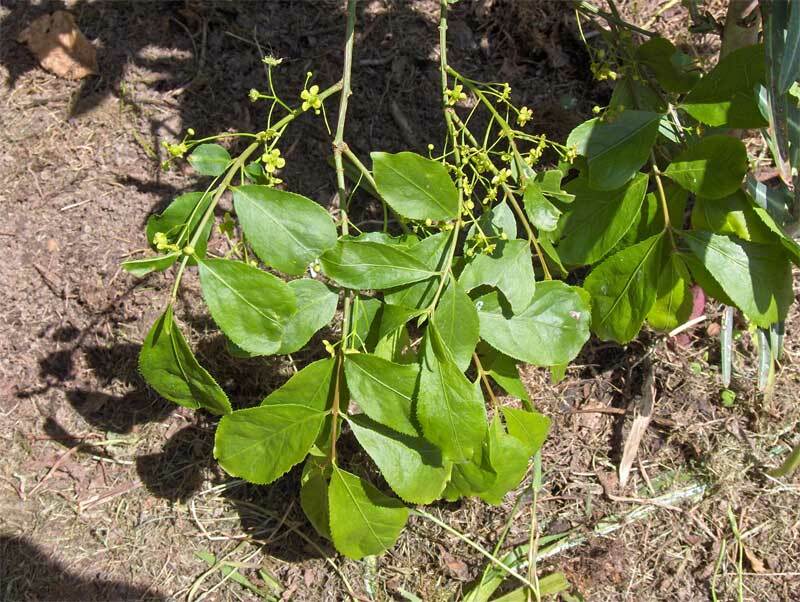 Leaves opposite, to 7.5 cm long, 4 cm wide, oval or widest above middle, tip blunt to slightly pointed, base tapered to stalk, margin finely toothed, shiny dark green above, paler green below. Euonymus japonicus flowers close-up. M. Fagg. Australian National Botanic Gardens.tropical.theferns.info (Accessed 7/2018). 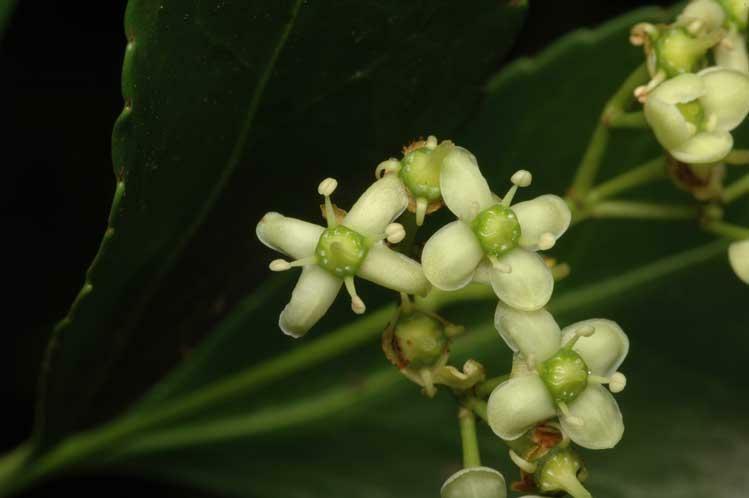 Flowers regular, greenish, 0.8 cm wide, 4 petals; June. Euonymus japonicus fruit. Qwert1234. tropical.theferns.info (Accessed 7/2018). Fruit pinkish capsule splitting open to reveal seeds covered with orange flesh (aril), Aug-Sept (Dirr 1990). Notes: Subject to Euonymus scale (Unaspis euonymi), anthracnose, crown gall (Johnson and Lyon 1991).